If you used the Glen Waverley or Sandringham lines over the weekend, you might have got a pleasant surprise. Both were running every 10 minutes for most of Saturday and Sunday — twice the usual frequency. Because the Frankston and Dandenong (Cranbourne/Pakenham) lines were closed between the City and Moorabbin/Westall between Friday 8pm and Saturday 4pm. The Dandenong line is also closed between Westall and Caulfield for the next two weeks as part of the big push to remove the final four level crossings as part of the skyrail project. Both the Dandenong and Frankston lines usually run every 10 minutes between 10am and 7pm. As part of their replacement with buses during the works, some passengers were shuttled to the Sandringham and Glen Waverley lines by bus. Running more trains on the Sandringham and Glen Waverley lines was a great idea – to minimise delays for people coming off other lines, and to help the trains cope with the extra loads. Apart from the official rail replacement buses, those using regular buses (or trams) to change lines also have benefited. One of my sons on Saturday decided to use the 703 from Bentleigh across to Brighton (12 minutes), then the Sandringham line (20 minutes), rather than catch a Frankston line replacement bus stopping all stations to the City (estimated 56 minutes). With half-hourly buses, and usually trains every 20 minutes, this would be potluck as to whether it worked. Trains every 10 minutes made the connection easy. People who usually use the Sandringham and Glen Waverley lines also got the benefit, though it’s doubtful that there was any patronage boost, since nobody knew about it. The only advertised change was that all trains ran direct to/from Flinders Street, not via the City Loop. It looks like the doubling of services will happen again next long weekend, with both the Frankston and Dandenong lines shut down again from Moorabbin/Westall from Saturday to the end of Monday, for both grade separation (Dandenong line skyrail) and upgrades to accommodate the new High Capacity Metro Trains. Frequent services make the whole network more usable, and if made permanent, would get more people on board. If only those lines (and the others) ran every ten minutes every day. Next → Next post: Is Google recording your conversations without you knowing? Another observation from the weekend re: the full utilisation of the network this past weekend. For the first time I can remember, the concrete viaducts were used by Sunbury/Werribee trains leaving the city loop for just Upfield and Craigieburn services. Additionally, the only trains through the city loop from Caulfield was the Frankston line with Sandringham trains terminating at Flinders, and Dandenong trains at westall. I don’t know the exact reasoning behind all of these changes (except the Dandenong trains), however upon reflection I wondered if this were a trial for 10min services. 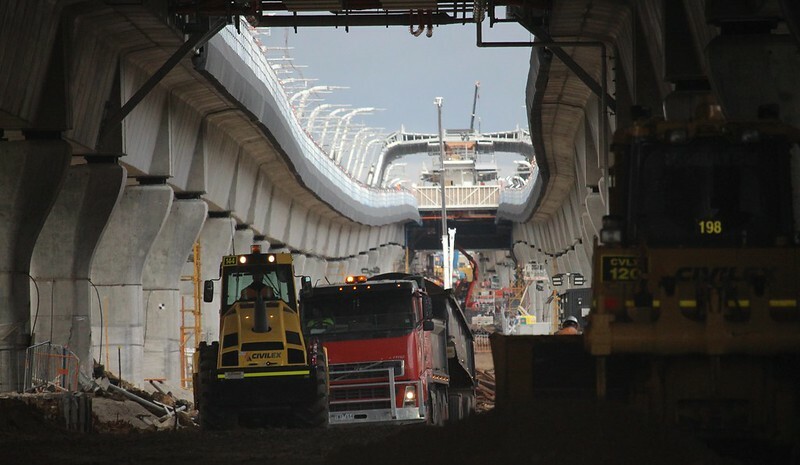 That each of these viaducts could sustain 10min frequency to the ends of each of these lines, or where double tracks permits it to happen currently (Upfield terminating every 2nd at Coburg, Hurstbridge at Greensborough, Running Camberwell-Alamein, Ringwood-Lilydale/Belgrave, Newport-Williamstown shuttles). If we take the imposed limitation of needing as many services as possible going into the city loop, and giving every train station between Burnley and Box Hill its own express train, we could run what we have much more efficiently than we currently do. TL;DR The weekend showed me that there is no constraint on running 10min services where single track doesn’t apply on the network. edit to above. I had meant to infer about Werribee and Sunbury services on the concrete viaduct as unusual for the weekend (when they normally use the city loop as frequency is reduced). There are lots of signs about buses on weekends for potential rail travellers from other lines at my local station (Brighton Beach) but nothing about extra trains. Thanks for letting us know. I’m going to Collingwood-Melbourne match on Queens birthday, so that will be handy. @John.S, it’s also notable that the Glen Waverley line ran direct to/from Flinders Street, mimicking the AM peak pattern, and also the eventual proposed use of the Burnley Loop by Belgrave/Lilydale line trains, but not GW. Not sure why Sunbury trains ran on the “new” viaduct. Sometimes that occurs due to works. The whole network looked completely different than how I’ve ever seen. Clifton Hill on Platform 3, Ringwood on 4, Northern Loop on 5, GW on 6, Carrum on 7, Werribee on 8, Sunbury on 9 and Sandringham on 12/13. I assume with Flinders St works, Platforms 1 and 2 were closed, and without two platforms for the northern loop, Werribee and Sunbury were taken out because of it (chosen specifically to reduce conflict points). But still shows what could and should be done not only on weekdays, but also weekends. 10 minute frequency for Glen Waverley and Sandringham appears to not be happening on Queen’s Birthday. Looking at travelling Saturday night from Southern Cross towards Glen Waverley, it appears bleak. There are no trains direct to Flinders St to connect. That leaves catching a Lilydale/Belgrave train and changing at RIchmond. The problem is that from Richmond, the usual 6/24 minute frequency remains, which means you’d have a 24 minute wait. Poor effort PTV/Metro. @Nick, it’s quite possible PTV have loaded the wrong data, just as they did last weekend before finally fixing it on Friday afternoon. I was always under the impression 10 minute running on the Sandringham line was not possible without a second platform at Sandringham/ reactivating platform 1 at Brighton Beach. Good to know there really are no constraints! In peak hour the Sandringham line operates about 8 trains an hour (about 7.5 minute running) with only a single platform at Sandringham (and usually only using platform 13 at Flinders St, I believe). The maximum frequency for a single platform is more like 12 trains per hour, I believe. Just confirming that as of 6/6/2018, the Frankston line timetable on the PTV web site (and thus also PTV Journey Planner and third-party services such as Google) for Queen’s Birthday 11/6/2018 is a regular holiday timetable, not a works timetable… hopefully they get the correct one loaded sooner this time. Works timetable for the Geelong line from today through to next week is also not up on the PTV website (at least not in the timetables section – although it is downloadable from the works notification page) nor reflected in Journey Planner. Wyndham Vale, Tarneit and Deer Park commuters can enjoy a couple of days of their trains not being clogged up with Geelong commuters!